Why aren’t kids taught more about food, where it comes from, how to cook it and how wonderful fresh food actually tastes? I have just turned 48 and have had the benefit of a decent, Western education, leaving school at 18 with several exam passes, then enjoying no less than nineteen gap years (otherwise called a career!) before progressing through university. When I try to recollect some of the stuff that I might/should have learnt when I was at school I’m left with a useless blurriness that one might get trying to view the moon through an unwashed milk bottle rather than a telescope. They taught me stuff about history, geography and science which, despite the fact that I couldn’t remember it longer than it took to pass the exams, hasn’t impeded my adult life one jot. 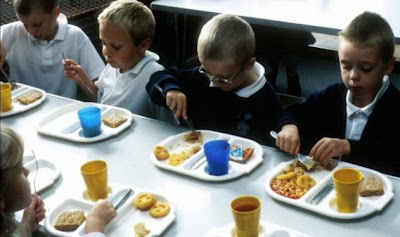 Why don’t we now expel this stuff from the curriculum and spend the time teaching children about food? Warming to the idea, I reckon we could even combine the subjects: how about teaching biology with bread making (how a yeast culture operates) for example ? Back to the rhubarb: I was talking about forcing rhubarb (down the throats of innocent children) and I want to tell you about forcing rhubarb itself. 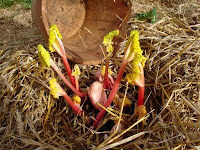 We were given two rhubarb plants last year by our neighbours, Philippe and Maryvonne, and now that they’re established, Gabrielle has been hiding one under a large terracotta pot, with a big stone on top to block the hole and keep the pot in place. The poor plant struggles in vain to reach the non-existent light it craves, going all pasty pink in a deliciously delicate way. 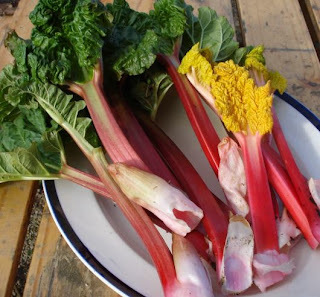 In the photo, the forced rhubarb has the yellow leaves. 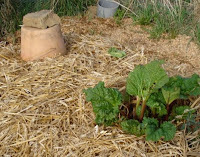 If you look carefully at the stem, you’ll see it’s white in the centre, where the un-forced rhubarb is green. This gives it a softer, sweeter flavour. It’s also a bit of a cut-and-come-again vegetable (no, it’s not a fruit in the same way that a tomato is not a vegetable) but we’ll remember to swap them over next year, so as not to exhaust the plant. Forced rhubarb, gently poached in water with a little sugar and orange or pink grapefruit juice, for just a few minutes, then strained, gives a sumptuously rich cordial with which to make sophisticated adult cocktails, plus a residue that you can serve with ice cream or flip into double cream to make a fruity fool. First cocktail: pour an inch (2.54 cm) into the bottom of a tall champagne glass then top up with sparkling wine and gently stir. Cocktail two: two shots of rhubarb nectar, two shots of vodka, half a shot of Galliano, one shot of double cream, crushed ice, shaken vigorously but then sloooowly sipped … hmmmmm! I’ll round this off by reverting to my digressionary topic of teaching children about food. We’ve got a young English couple staying in our holiday cottage who, despite our prohibition on children and pets, are staying here for ten days with their sweet daughter, 2-year-old Jasmine. She’s taken charge of putting the chickens away in the afternoon and picking the eggs out of their nest box, collecting dandelion flowers for Mrs Bunny and feeding the sheep at the end of the afternoon. She also joined in with the chorizo sausage-making course we gave to her parents, Meg and Ali. They’ve spent the last few years living in rural Ecuador, which has given them a wonderful perspective on life. I was impressed to hear Meg talking about pigs and making oinking noises when explaining that we were going to make sausages to eat. How nice to know, first hand, that chickens give you eggs and pigs tasty pork. This is Jasmine “helping” Meg mix the spices into the porkmeat. Postscript : After a long day, with me on our barn roof followed by the chorizo course accompanied by a cider comparison (this one or that one … ooh, I just need to try the first one again) had left us a little late and a little tired and nothing for dinner. Until Gabrielle suggested we do a pasta something with the chorizo sausage mix leftovers and I said “lasangne”. In less that the time it takes me to type the blog—and out of nothing—she’s thrown the few available things together and rustled up an award-winning Italian / Mexican fusion dish of Chilli-con-Lasagna, with a crunchy side-salad. No TV chef cookbooks required, just an understanding of food. Thanks for your fun and interesting blog. My husband (a native of France) and I are considering a move to France from the US and also starting a Permaculture farm/Forest Garden. I was wondering how easy it is in France to purchase edible plants that aren't necessarily the norm in most gardens (i.e. Persimmons, paw paw, hardy kiwi, mushroom spores, etc.) Are there good sources for these types of things? Thanks! Thanks for your kind comments. Finding the sort of plants that are not in your average garden centre is definitely possible. The more we learn the language and integrate, the more easy we have found it to discover specialist suppliers. Also, because we are in Europe, it is easy to import plants or seeds from specialist suppliers in other European countries. It is even possible to import plants from the US but you'd need to get a phytosanitory certificate issued and use a reasonably quick courier, I guess. As you may be changing climate zones, you might also find that some of the plants you use where you currently live wouldn;t be appropriate in your new homeland and you'll need to discover new plants, which is fun!